I receive, on average a hundred emails a day between my work and personal accounts. A couple weeks ago, I opened up my Gmail account—I had 14,603 items in my Inbox. At work, I noticed I had 2,216 emails…unread. I knew I was facing a moment like Michael Scott—I needed to declare bankruptcy. In both accounts, I wanted a safety net. So in Gmail I created a label named “Languishing 2013.” I applied that to every single message in my inbox. I looked at the last few weeks of messages to make sure there was nothing needing attention. Then, I archived those 14,603 emails like a boss. At work, it was a bit more complicated. I went into the Outlook program on my laptop (I normally use the web app). There, I created a folder called “Languishing 2013.” And I moved every single email—thousands and thousands of them—from my inbox to that folder. I wanted to shout like Braveheart. Except I wasn’t dying…and I was in my cubicle at work. For a number of months, I had long kept lots of emails in my inbox in hopes of taking some action on them—starting a project, reading a book, setting a meeting, etc. But the truth of it was, I was kidding myself, and I was kidding my colleagues and friends. I was not going to read those 20,000+ emails. I was not going to start all the good ideas therein. I was not going to do anything except reference them. The thousands of emails in my inbox were functionally archived. But they sat there, stressing me out. If you’re going to go back to them, prove it, Hot Shot. 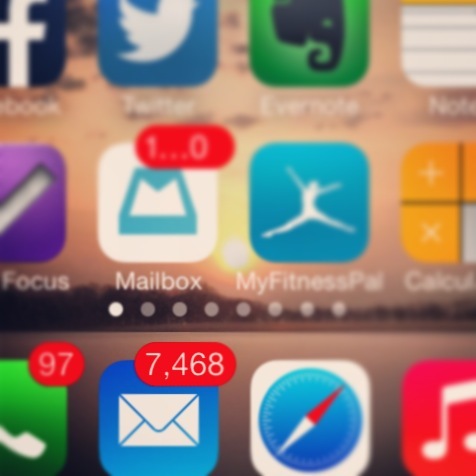 If you have 1,000s of emails in your inbox, you’re not doing yourself or anyone else a favor. Tune in Thursday for five more tips on email sanity. Do you agree or disagree? Have you ever declared email bankruptcy? How’d that work out for you? Leave a comment. Good stuff, Clay. “Self-inflicted” is right! Thank you for reading (and for making the days count). Email, my old nemesis! This is a great idea. Most of the time it feels like answering emails is my full time job. Looking forward to the other tips coming Thursday. We should compare notes. My new system involves heavy use of evernote, and is changing my world. Gmail currently at zero, and work inbox rapidly decreasing by the day. The Languishing 2013 archive is a great move! Since I saw your last post I decided to move towards getting rid of the thousands of email floating around in my inbox too. I was having no problem deleting pages emails while they were a year old, but still felt like there was going to be the off-chance of deleting something I actually needed from the last 6 months. The archive is a good way assuage the fear of shooting myself in the foot but also cleaning house! Another clutch move, Sir Jeske. Adam – I’m a big believer in not using your inbox as a todo list. It’s just too stressful. I agree with Andy Moore that Evernote is a good tool for managing todos/tasks…way better than an inbox. Evernote has a feature that you can email something to your account. I just forward emails that have things for me to do in them–takes a few seconds per email. Everything else either gets deleted or goes into a folder labeled ‘reference’ where I can search for a message if I need it. Inbox zero is a good feeling.